"When I was little I used to live next to a Greek family, who would make these cookies year round, and give tins of them to neighbors around Christmas." Preheat the oven to 400 degrees F (200 degrees C). Grease cookie sheets. In a medium bowl, cream together the butter, sugar and egg until smooth. Stir in the vanilla and almond extracts. Blend in the flour to form a dough. you may have to knead by hand at the end. Take about a teaspoon of dough at a time and roll into balls, logs or 'S' shapes. Place cookies 1 to 2 inches apart onto the prepared cookie sheets. Bake for 10 minutes in the preheated oven, or until lightly browned and firm. 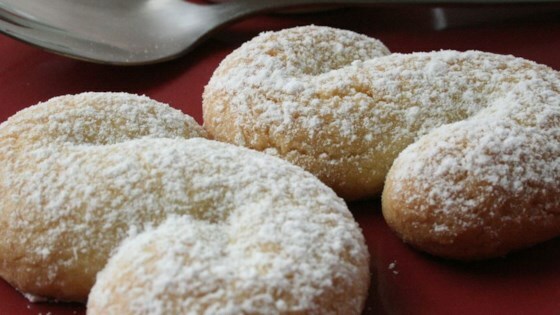 Allow cookies to cool completely before dusting with confectioners' sugar. followed the recipe to a "T" and these cookies turned out great! mouthwatering and addictive, they were a hit with my friends over tea. Good with a tall glass of milk as well. Easy, quick and oh-so-delicious! Everyone loved these. To make them a little more tender, I only used 2 1/4 cups of flour. Enjoy! They are not so bad. Very similar to other short bread cookies. very light on the sugar, which I like! I think next time, I will add a bit more almond extract for more flavor.